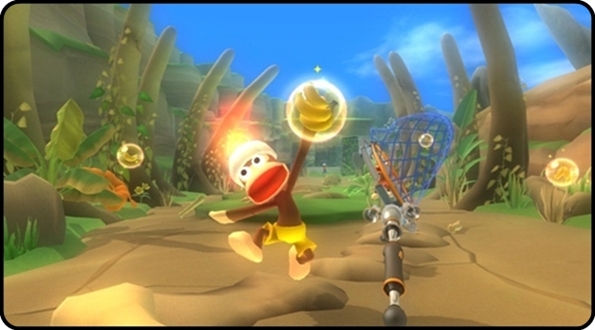 The Ape Escape games on PS1 and PS2 utilised the dual-analogue sticks of the controller to masterful effect, so it felt natural to be excited about how the PlayStation Move motion controller would add to the game’s experience. The original games were action-packed platformers where you had to capture cheeky monkeys. The right stick controlled gadgets like nets, catapults and monkey detectors with fantastic efficiency. The logical step for the Move would have been to use the navigation stick or Dualshock to run around and the Move controller to swing your net and other gadgets. Instead, the game has been reduced to something resembling a first-person on-rails shooter. The catapult, which is fired with the trigger, is used to collect bananas, destroy objects/robots and annoy monkeys. When the on-rails section pause, you will have to capture some monkeys with your net. When you swish the net around the screen, it’s impressive to see it react in true 1:1 fashion. Unfortunately, the art of capturing monkeys is very hit and miss. You have to wait for them to come to you before you pounce with the net. Sideways scoops seem to work the best, as the downwards ones usually fail to catch anything. You can turn left and right to defend your flanks when you stop, but forwards movement is a no go. If a charging monkey escapes your angry flailing, he will steal some bananas off you. These act as your health metre, so you’ll have to hit them with the catapult before the thieving sods scoff them down. For the on-rails sections, you also get a fan to hit bananas and batteries can be collected to utilise your special powers. These include a machine that turns objects into bananas or a vacuum ray to hoover up monkeys. The vacuum ray makes an absolute mockery of the boss fights against the Spectre impersonators, as instead of chipping away at their health with the catapult you can defeat him in seconds if you have a battery saved. Some monkeys have varying attack patterns such as, leaping, zigzagging or dashing on their approach. Others are armed too: with old-fashioned bomb-balls or with uzis that fire vision-reducing paintballs. The catapult comes in use to stun the monkeys when they’re about to fire and it can also be used to deflect incoming fire. The levels themselves are brightly designed although the overall textures are leaning towards last-gen if we’re honest. Theme parks, a house, an Asian city, a frozen dinosaur theme park, a haunted house and a tropical volcanic island make up some of the locations, with the monkeys dressing for the occasion accordingly. 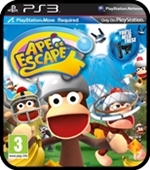 There’s plenty of character on show, with much of it meant to please a younger audience, which makes it a shame that the game rapidly becomes very difficult with large numbers of monkeys storming towards your glued-down self as the controls desert you and leave you swinging madly. Some decent minigames might have helped to extend the playing experience, but there are not a lot of them and they’re pretty poor. The worst being a two-player RC car and shooting experience that lasts about 30 seconds and the best being a sniper type game where you have to find specific monkeys in a crowded scene, a simian take on Where’s Waldo that could have been a classic if the controls were not so shaky. It’s confusing as to why the single player game isn’t playable in co-op as we’ve seen plenty of two-player on-rail shooters on the Wii. Taking turns would be the best option then for multiplayer, but in all honesty, you’ll have finished in a few hours and there isn’t much compulsion to collect any monkeys you have missed thanks to the on-rails nature of the game. The Short Version: Despite simplifying the concept over the original games, it feels harder than it should thanks to the limited control setup and lack of gadget choice. The budget release price speaks volumes about the lack of ambition here; let’s hope there’s still a chance for a proper sequel in Ape Escape 4.